There was some grumbling on Facebook that an entire downtown Albany parking lot and adjacent street were blocked for a special event. But the closure, planned since February, had the support of the Albany Downtown Association. The “Brewfest” started Friday night and continues Saturday (today). It’s a bash featuring music, food, and beer as the name implies. The whole thing is a benefit for the Albany Boys and Girls Club, whose operations director Maya Perez said in the application for a city permit that about 2,000 people were expected to take part. The Two Rivers Market parking lot and Ferry Street between Second and Third were blocked for the event. The Boys and Girls Club applied for a city permit for the closure and amplified outdoor music in February. The city staff approved it in March. The director of the Downtown Association, Lise Grato, had written an email supporting the siting. She wrote she had spoken to key merchants and restaurants adjacent to the parking lot. 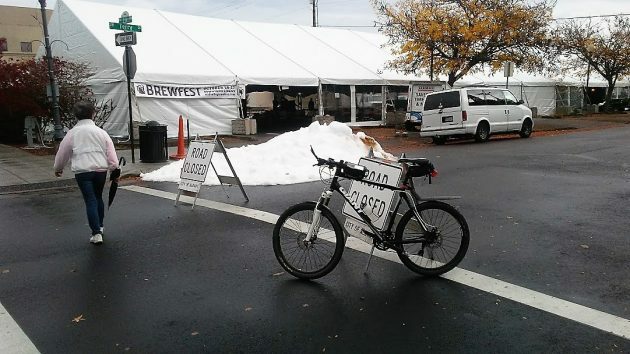 This annual beer festival and benefit used to be held on Water Avenue along the riverfront. No word on why the more central location was chosen this time. Are you thinking of the crabfest that is annually held at Calapooia brewing? So I’m wondering if this type of marketing influences when kids start to use alcohol or increases their consumption if they are already using? I wonder the same thing when the city pushes events like Library Uncorked? Are the Boys and Girls Club, and the city, adequately protecting our kids with these alcohol-fueled events? I wonder if the City would be amenable to a cannabis festival downtown with tents and hookahs? Imagine the Library putting on a Reefer TorchedUp event. Imagine a Boys & Girls Club “Weedfest” benefit. Would the city and club discriminate because their drug of choice is alcohol? Go ahead, be a smart – – -. That is so attractive in an elected official. Some people think so, hence we have Trump. I used to think there would be a parking problem downtown, but, alas, there isn’t one, as the carousel isn’t that busy!!!! And, also there are several vacant storefronts. The problem isn’t smart alecs. The problem is too many uninhibited, angry CAVE people. Uninhibited member of CAVE who will not cave!!!! The contract for $155,000 is with an outfit called Buxton, which says it uses advanced analytics and data to help communities attract and retain businesses. What metric are you using to determine the ” …carousel isn’t that busy…”? My observation is that it seem to have a steady flow of visitors. I eat downtown multiple times a week and shop near there as well. On more that one occasion I have had to circle the block for parking (not a parking problem). I have read the information released by the nonprofit running the carousel and they indicate fairly significant numbers of visitors. We have taken our son and exchange student there multiple times. So my information is purely observation based, but it counter to your assertion. For those that desperately try to make this Brewfest about kids or other nonsensical things, until you open your Phil Knight sized checkbook and support the B & G Club or the library, kindly give it a rest. The event is for adults and is a great event to attract customers downtown. It happens to raise a small amount for the Club, which serves thousands of youth in this community, from all demographics. Now that would be a great place for Hasso’s bike to take him, stop by the Club and figure out how many amazing things are happening for our kids. I know, it could possible be a positive story, unrelated to CARA or tax dollars or back-in parking, or complaining about regular citizens that have the nerve to volunteer and serve as an elected official. I read articles here and think, maybe this will be the article where the dependable few will give it a rest or just not comment, rarely am I right. They find some random veiled thread to tie it back to progress and growth. I’ll step off my soap box…. Thanks for the positive moment. I haven’t been to the Brewfest yet but I think it is a good idea. I think we need to lighten up and enjoy life a little more. It seems things are way too serious lately.